You may not be involved in illegal downloading or file sharing anymore, but bits of useless information trivia always come in handy, don’t they? According to Find That File, the file type that is downloaded the most today is AVI. This covers movies and other video files. Next in line are the PDF and RAR, which typically refer to e-books. 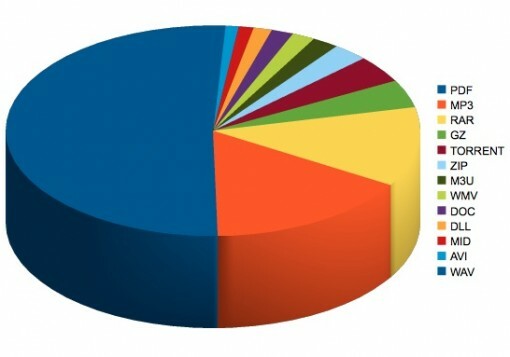 The pie chart below shows downloading preferences of people with regard to the type of content. The proliferation of e-book readers is also contributing to the popularity of e-book downloads. Add to that the fact that mobility is key to most people, having books in electronic format is really bound to make e-books more popular. What about mp3s? Where did they go? For sure, people are still downloading music via shady means, but I think that the ease and price of legal downloads play a role here somehow. More so, we also know that albums and discographies can be downloaded in RAR or ZIP format. Since the survey only took the extensions in consideration, music can actually be part of the top downloaded file types.